Jane Powell and Vic Damone. 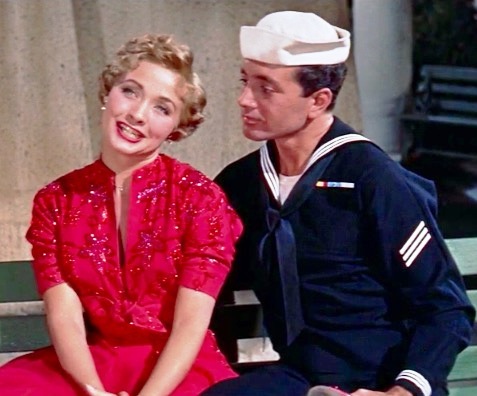 Big, splashy Broadway-style musicals had peaked in popularity when MGM released Hit the Deck in 1955. So, kudos to the studio for putting together an incredibly talented cast headlined by Jane Powell, Debbie Reynolds, and Ann Miller. Their male co-stars, though not as well as known on the silver screen, were famous in their right. Crooners Tony Martin and Vic Damone produced records that sold millions and Russ Tamblyn had a key role in the previous year's Seven Brides for Seven Brothers. 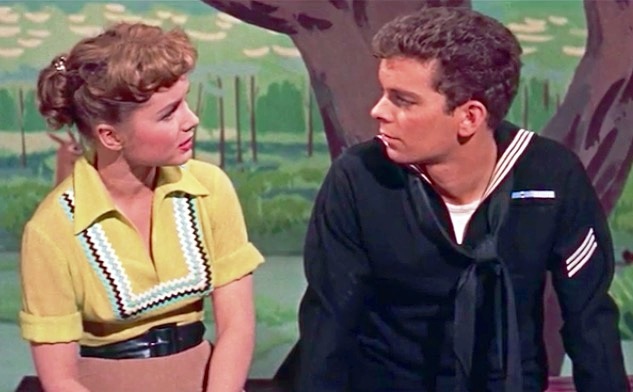 Debbie Reynolds and Russ Tamblyn. Martin, Damone, and Tamblyn play three sailors on leave for two days in San Francisco. 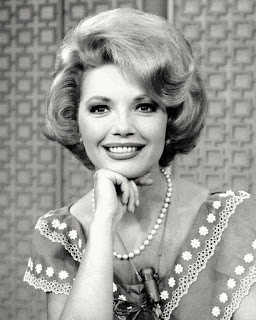 Martin hopes to reunite with his fiancée, showgirl Ann Miller. She gives him the cold shoulder, though, after a six-year engagement with no marriage proposal in sight. Meanwhile, Tamblyn learns that his sister (Jane Powell) is involved with a womanizing musical star. He and his chums "rescue" her, but then face disciplinary actions for unacceptable conduct. They spend most of the movie trying to avoid capture by the Navy's shore patrol. Loosely based on a 1927 stage musical with the same title, Hit the Deck is a thinly-plotted excuse for some great musical numbers. Ann Miller dances up a storm in "Keepin' Myself for You" and in the reprise of "Hallelujah" in the finale. Jane Powell warbles the funny "Lucky Bird" to a toy penguin. The three male leads harmonize nicely on "Why, Oh Why?" (my favorite song in the score) and later the ladies reprise it. Finally, Tamblyn and Debbie Reynolds perform some nifty acrobatic feats in an elaborate funhouse sequence. With its colorful costumes, bright sets, and catchy tunes, Hit the Deck is a pleasant diversion for those who enjoy Broadway musicals. 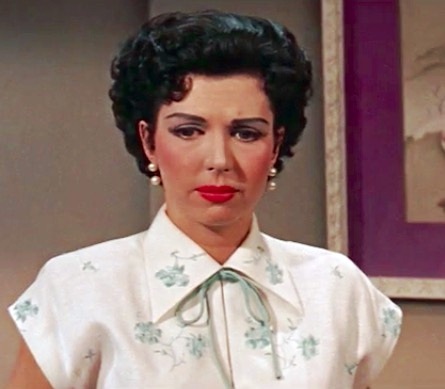 It will also make you wonder why Ann Miller didn't become a bigger film star. Along with Tamblyn, Jane Powell also appeared in Seven Brides for Seven Brothers, which brings us to their Brides co-star Howard Keel. We recently watched him in Callaway Went Thataway (1951), a non-musical comedy that spoofs the popularity of Hopalong Cassidy in the early 1950s. Dorothy McGuire and Fred MacMurray. 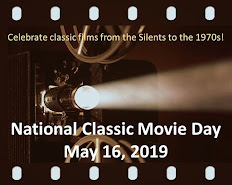 Fred MacMurray and Dorothy McGuire star as Mike and Debbie, a pair of marketing executives who get caught in a bind when cowboy star Smoky Calloway suddenly becomes popular with the nation's kiddies. A food company wants to launch a cereal (Calla-Cracklys) and invest $10 million in a new series of Smoky television films. That's a big problem because Calloway's "B" Westerns were made ten years earlier and Smoky was "a washed-up, beat-up drunk" when last seen--and no one knows where he is now. 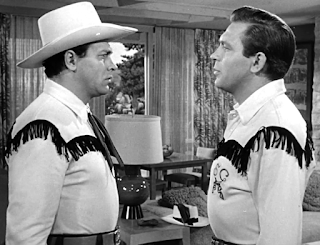 Not long after Mike and Debbie launch a desperate search for Smoky, they receive a letter from Stretch Barnes (Howard Keel), a real-life cowboy who is mighty tired of people mistaking him for Smoky Calloway. Sure enough, Stretch is the splitting image of the cowboy star and it's not long before Mike and Debbie convince him to "become" Smoky. Their plan seems to going pretty well when--you guessed it--the real Smoky Calloway is found. Howard Keel and Howard Keel. Despite the presence of bigger stars, Howard Keel steals the film with his dual performance as the sincere, naive Stretch and the hard-drinking disreputable Smoky. Esther Williams, Clark Gable, and Elizabeth Taylor have cameos as themselves. 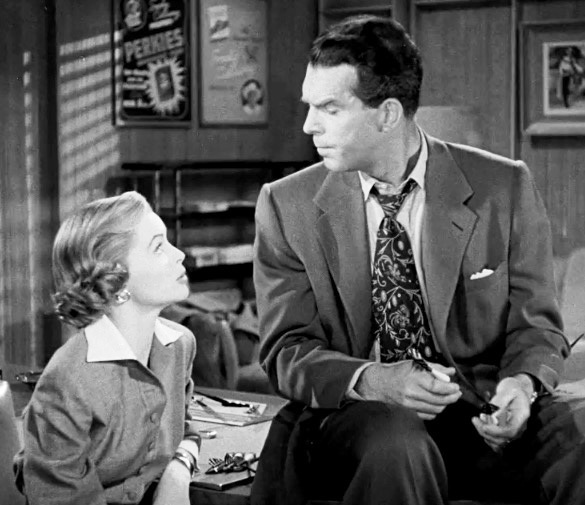 Plus, look quickly and you'll see Hugh Beaumont pass Fred MacMurray in a hotel hallway. By 1960, they would be two of the best-known fathers on American television. A pleasant musical, and a movie that should have launched Keel into more dramatic fare. Both well worth seeing any time. In the 1980s we enjoyed Jane Powell and Howard Keel on stage when they toured in South Pacific and a stage version of Seven Brides for Seven Brothers. Grand nights! in 1955. Those days would soon come to an end unfortunately. Howard Keel was one of those talents. Thanks for covering these films Rick.